A pop star receiption for Prince Charles and Duchess Camilla. 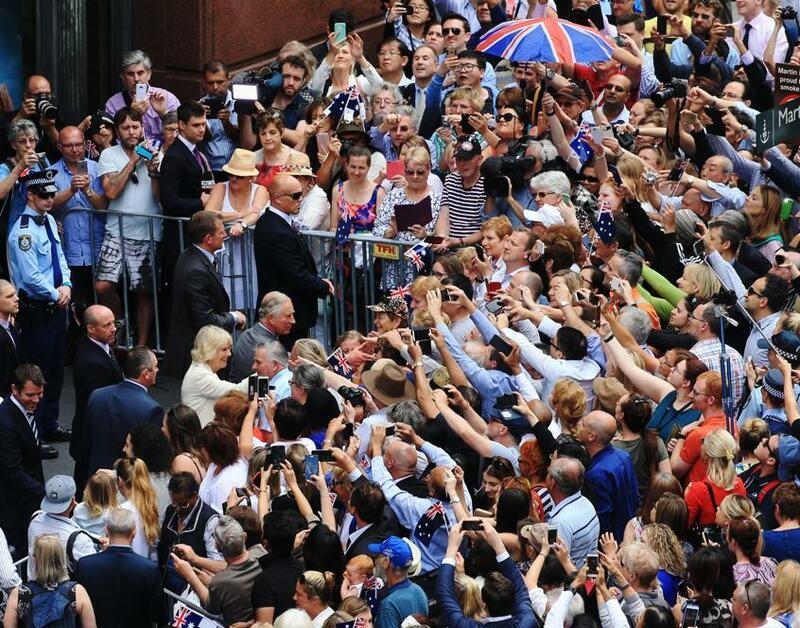 The Prince of Wales and The Duchess of Cornwall spent a day in Sydney, and were welcomed to the city by thousands of well-wishers. 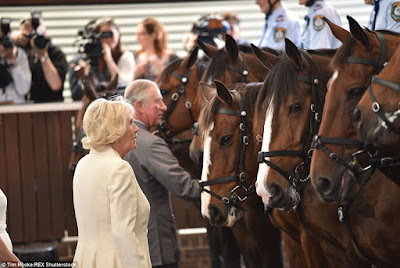 Prince Charles and Duchess Camilla’s visits in Sydney began at the New South Wales Mounted Police, the oldest continuous Mounted Police unit in the world. The Prince of Wales and The Duchess of Cornwall visited the New South Wales state mounted police headquarters. Their Royal Highnesses watched a display of horsemanship and training for crowd control by officers from the unit before the riders came forward on their horses to meet the Royal visitors. 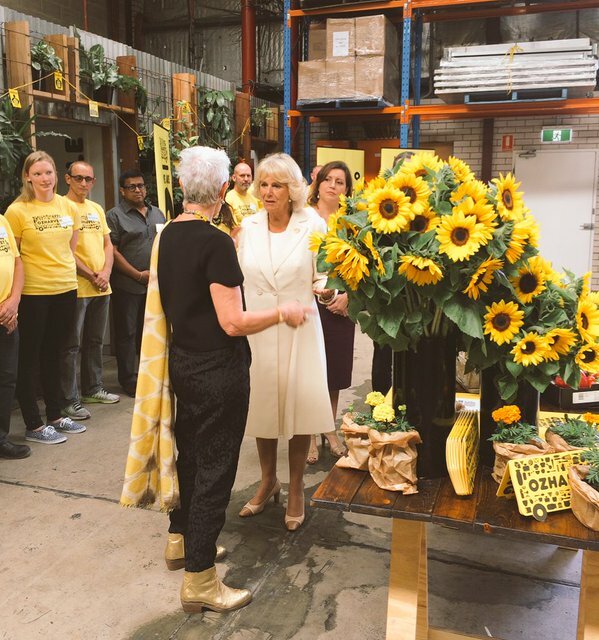 The Duchess of Cornwall then visited the Sydney headquarters of OzHarvest, an organisation which provides charities who feed those in need with unwanted produce from restaurants and other food outlets. Her Royal Highness toured the building and met Chrissy Mulyneux in the preparation kitchen who was making mouth-watering bread and butter pudding with dried apricots and raisins. Now in its 11th year of operations, OzHarvest has more than 30 vehicles on the road operating across Sydney, Adelaide, Brisbane, Gold Coast, Canberra, Melbourne, Newcastle and Perth. Meanwhile, The Prince of Wales attended the Psychological Recovery Following Community Disaster Roundtable event.The roundtable was held at the Macquarie Group Building and attendees included CEO of Macquarie Group, Nicolas Moore, Chairman of The Prince’s Charities Australia, Tony Beddison, and the Chief Executive of The Prince’s Charities Australia, Janine Kirk. During the meeting, His Royal Highness and those in attendance discussed psychological recovery following man-made or natural disasters. The Prince also met front line responders, including serving and former military personnel, and disaster survivors. In the afternoon, The Prince of Wales and The Duchess of Cornwall were welcomed to Government House for a reception to celebrate the work of Australians who have made a difference to their local communities and the nation. TRH were greeted with a ‘Welcome to Country’ ceremony, performed by Uncle Chicka Madden, Gadigal Elder. These ceremonies are given at special occasions as a mark of respect. 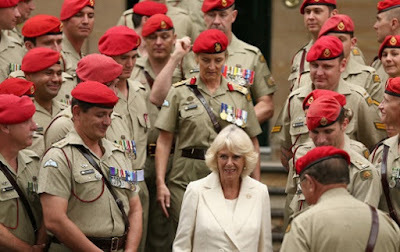 The Duchess of Cornwall, Colonel-in-Chief, The Royal Australian Corps of Military Police, with members of the Corps during a visit to Victoria Barracks. Later, The Duchess of Cornwall visited the Victoria Barracks, home of The Royal Australian Corps of Military Police. Her Royal Highness’s visit marked the Corps’ 100th anniversary, which will be celebrated next year. The Duchess has been the unit's Colonel-in-Chief since 2012. Her Royal Highness joined a reception with members of the Corps, and was invited to cut the centenary cake. The military police serve in the army in Australia and around the globe, and over the last fifteen years have been deployed to Solomon Islands, Pakistan, Lebanon and Iraq and Afghanistan. The Head of the Corps, Brigadier Cheryl Pearce, said: "It's a real honour to have The Duchess here. When she became our Colonel-in-Chief in 2012 it was just the start of a tradition and we want to continue with her into the future. This was a chance for her to meet our soldiers and our soldiers to meet her."